Having been brought up adoring the fantastical world of Roald Dahl and remembering the original “Charlie and the Chocolate Factory” movie with Gene Wilder as my childhood favourite, as a Mum of two children, I am now re-entering the wonderful world of Roald Dahl and loving it even just that little bit more. Not just the mind-bogglingly marvellous stories, characters and rich descriptions but to see the joy in my children’s eyes as they experience for the first time this whole new inspirational world. As winners of the golden ticket, this enchanting book takes the reader through a truly personalised journey through Willy Wonka’s magical factory with their friendly guide “Lomo” to experience new and exciting rooms, go on adventures and ultimately make their own award winning scrumptious chocolate bar specifically customized for your child. Everything in the story is inspired by your child’s name and tailored especially for them. 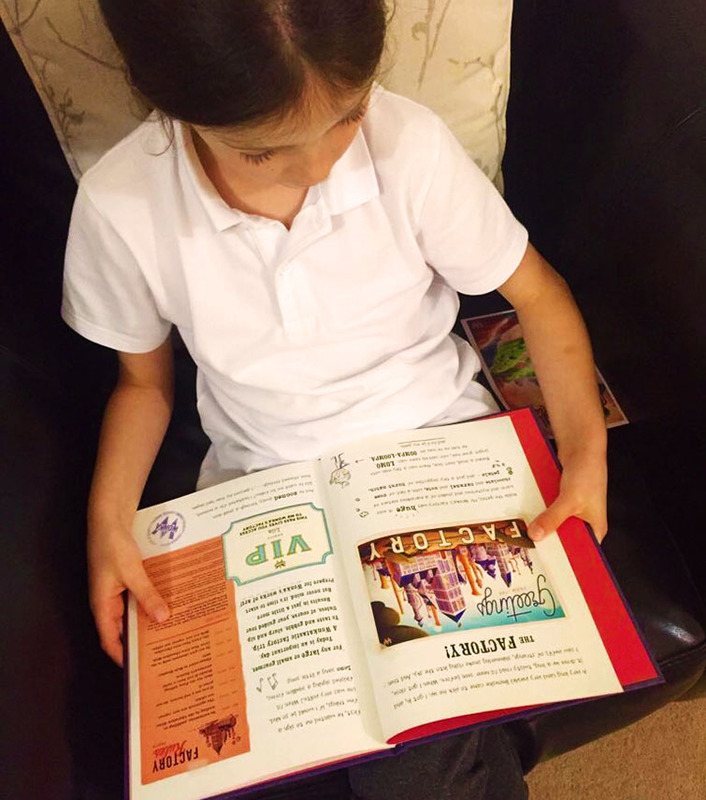 Wonderbly have created a very clever and unique book which is not just a version of Charlie and The Chocolate Factory with a child’s name dotted inside. Instead, every name gets a different story, including their own unique candy with their name on it, special Oompa Loompa song cleverly written using the letters in the child’s name, a personalised Award-For-Excellence and their own Wonkafield family tree – showing how their own surname is derived from a special fruit! With no two adventures the same, it is really a unique and accomplished gift. My daughter was absolutely mesmerized from page 1 with the beautiful illustrations, detailed factory plans, descriptive vocabulary and wonderful Oompa Loompa songs especially made for her. Each page is a visual array of creative genius that is designed to pique the interest and inspire creativity in young minds. 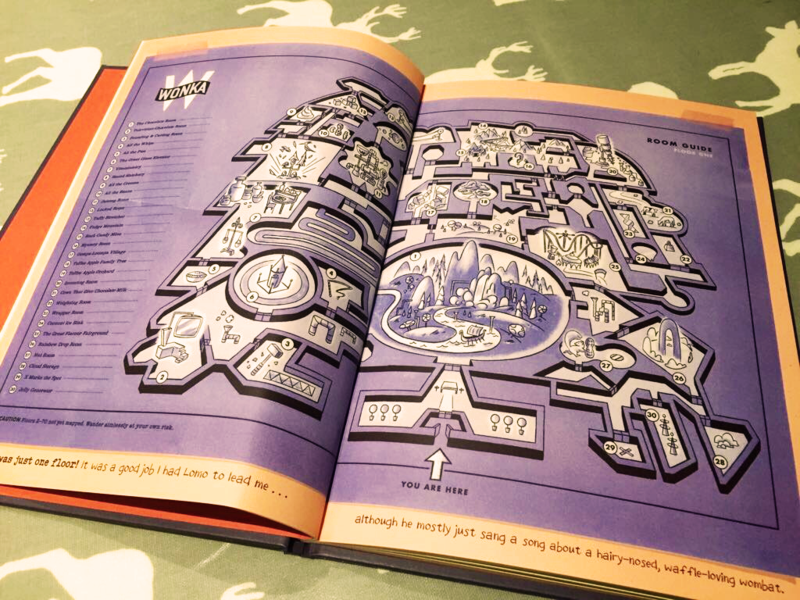 With such attention to detail, there are factory rules, maps, tickets, songs, poems, family trees, machinery instructions and so much content to devour – and we sang too! The book also smells just WONDERFUL! A chocolatey delight which oozed its fragrance on every page, a unique feature and we couldn’t stop smelling it. We both laughed out loud in parts at the antics in the factory and giggled at the rhymes – can you imagine what rhymes with ‘artiness’? 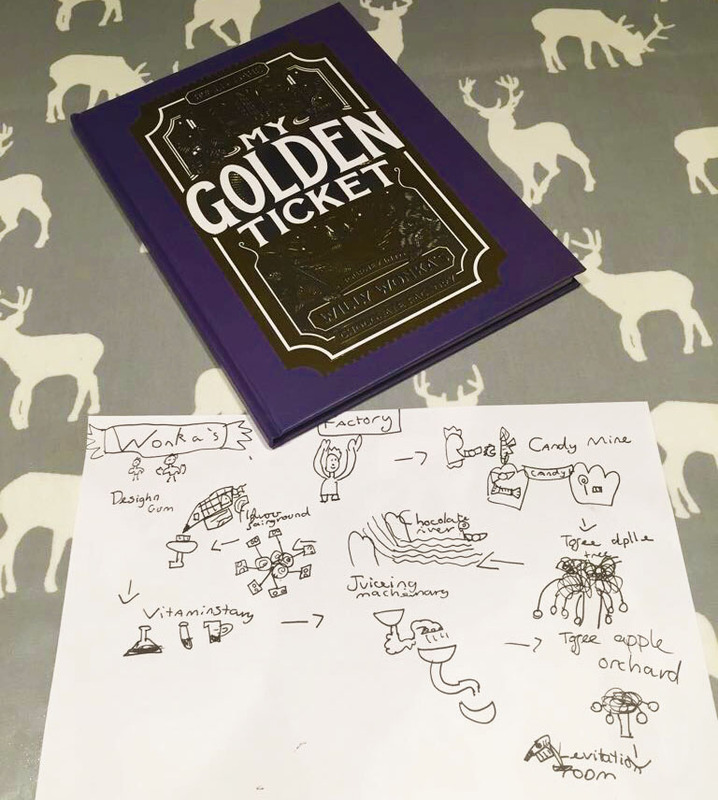 We have had to read this winning book time and time again and it inspired my daughter to go and create her own chocolate factory design, draw intricate maps and pen her own adventure stories with her new friend “Lomo”. Thank you Wonderbly for such a beautiful book, it would make a wonderful and treasured gift for children this Christmas and is certainly one we will revisit time and again to experience the irrefutably genius and magical world of Willy Wonka. Save 25% on your own My Golden Ticket Personalised Softcover Story Book here!